Caponi Art Park is open to the public, free of charge. and support the park’s educational and cultural programs. • Park trails are for pedestrians only. • Cars and bicycles are not allowed beyond the parking lot. A bike rack is available for your use. • Please help keep the park clean by using trash receptacles located throughout the park. • Dogs are welcome. Please keep dogs on a leash and pick up after them to keep the park clean. • Please do not climb on the moss. The moss is a part of the art and difficult to maintain. • Children should be supervised at all times. Children are encouraged to touch the sculptures, however, for safety sake and to prevent damage, please do not climb on the art. • Buildings located on park property are closed to the public. 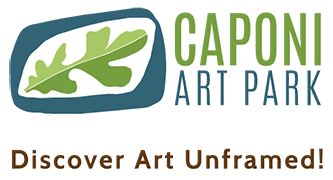 Caponi Art Park is located on 60-acres of rolling wooded land in Eagan, MN. Situated off of I-35E from Hwy exit 94 between Pilot Knob Rd and Lexington Ave, the Art Park is just a short drive from downtown St. Paul and Minneapolis and the Mall of America. Public parking is located on the south side of Diffley Road. The pedestrian tunnel running under Diffley to the north side of the park is accessed from this parking lot. In addition to our main parking lot, performance parking for the Summer Performance Series and select events is available at the Lexington-Diffley Athletic fields. Banners and signs will be posted. Walking distance to amphitheater is comparable from either entrance. For people with limited mobility parking is available adjacent to the sculpture garden in the private parking lot at 1205 Diffley Road, Eagan. Please call 651.454.9412 for further information and to inform staff of your need. This will ensure that we have adequate space for your vehicle. Caponi Art Park takes pictures of participants during its programs. Please be aware that these photos may be used in our printed materials and website. If you or your family members do not want to be photographed or published, please express this to a staff member or photographer on site. Caponi Art Park, and its unique spaces, art and earthworks, is a distinctive place to inspire photographers to shoot images unlike any other. Visitors are welcome to take still photographs and videos for personal, noncommercial use. Permits are available for commercial photographers to use for nature stills, family photos, senior pictures and engagement portraits. All photographers should honor these policies when using Caponi Art Park as a backdrop for any photography or filming. Respect the art and earthworks: Do not climb on the sculptures, walls, trees, delicate moss or gardens. Respect other visitors: Photographic equipment should not encumber or interfere with other visitors enjoying the park.